The Walasi-Yi Interpretive Center is a small stone building located along US 19/129 at Neels Gap, Georgia, on the eastern side of Blood Mountain. It is notable as the only place where the 2,175-mile-long Appalachian Trail passes through a man-made structure. It is currently the first mail-drop available to northbound thru-hikers that does not require one to leave the trail. It was a beautiful day for a hike, sunny and in the low 80’s. We hit the trail at the Byron Reece parking area and quickly ascended the initial 7/10 of a mile to intersect with the white blazed AT. At the AT, we turned right to go up Blood. All along the way, especially going up, we kept a quick pace, reaching the summit in about 50 minutes. At the top, we hung around, drying off in the sun and the cool breeze for a bit, chatting it up with other enthusiasts. Then we bit adieu to the sun and headed down the back side of Blood, under the shady tree cover, to Bird Gap. At Bird Gap, we left the AT and connected with the blue blazed Freeman Trail, which hugs along the side of Blood Mountain taking us back to our starting point at Neels Gap. We finished the hike before noon, so we stopped at Mountain Crossings, sat at one of the picnic tables and ate the lunches we carried all over the mountain. It’s about a 5.8 mile hike and I’ve done it many times before. If you do it, I recommend you get to the Byron Reece parking area early, as it fills up fast on nice days. Final comment: it’s a good climb up Blood Mountain. 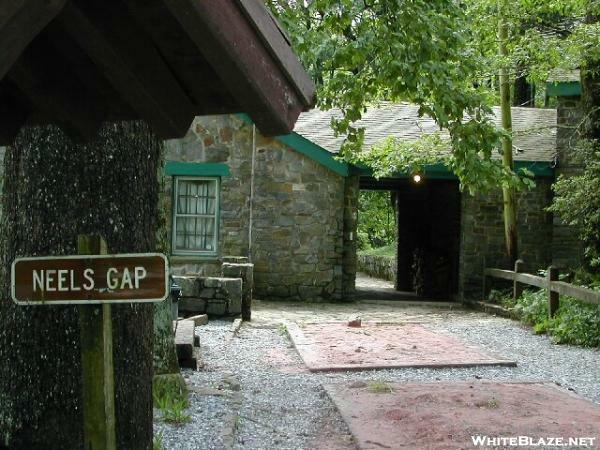 The elevation at Neels Gap is 3,109 feet and Blood Mountain is 4,461 feet, so the gain is 1,350 feet. But the hike was far easier than any of the Insanity workouts. I didn’t try, but I think if I slowly jogged up the mountain, I would be entering a realm similar to Insanity. This entry was posted in Backpacking, P90X-Insanity Hybrid, Round 2 and tagged Appalachian Trail, Blood Mountain, Freeman Trail, Hiking, Mountain Crossings, P90X-Insanity Hybrid, Rest. Bookmark the permalink.